This post is the first in a series exploring the four philosophies of the Music Together® program. It is such an honor for the Prelude Music Classes team to be a part of a child's musical journey. Many of our students have been with us since pre-birth, joining us in utero while an older sibling participated in class. Others started as infants, as toddlers, and as three- or four-year-olds. Regardless of the age at which they started, they have one thing in common: they are all musical children. We see and welcome children representing all learning styles, personalities, and abilities. Some children never leave their parents' or caregivers' laps. Some leap into the middle of the circle and start singing and dancing immediately. Some walk laps around the circle while we sing. Some touch walls, windows, door knobs, the piano, and other objects in the room throughout the entire class. Some sing with us continuously, while some seem to stare at another grownup. This is to be expected, and it is natural! All children have different temperaments, and often a child's personality and learning style are different from mom's, dad's or an older sibling's. It can feel frustrating when we have expectations of how we want our children to learn, behave, or be. We encourage you to embrace your child as he or she is. Become a master observer and trust that our Music Together class provides the learning environment your child needs to thrive. Again, we know that all children are musical, and all children have different ways of absorbing information and expressing the information they learned. The children in our classes are all in Primary Music Development (PMD, a term coined by Music Together's co-authors, Ken Guilmartin and Dr. Lili Levinowitz). PMD is a journey that begins at birth and continues until the child achieves basic music competence. Basic music competence is defined as having the ability to sing in tune (in any key) for an entire song, and move one’s body with accurate rhythm. Many grownups have not yet achieved basic music competence and are still in their own journey of PMD. Learning to sing in tune and move with accurate rhythm is an achieved, learned skill. It requires exposure and experimentation. Every time you show up to class, your child is being exposed to music-making, and he or she has ample opportunities to experiment and learn through play. Yes, even if your child is walking around the room throughout the entire class, she is learning from the exposure and the opportunity to experiment and explore in a musical environment! During the PMD journey, there are two systems emerging: the receptive system and the expressive system. The receptive system is all about input, or taking information in. It develops through hearing and is dependent on exposure. It also develops through musical thinking, or "audiation," which you will hear us talk about in class. The term was coined by Dr. Edwin Gordon, and it simply means "thinking music." It is the ability to hear a song in your head and then sing it. Audiation takes practice, and your children have ample opportunity to practice it in class. The expressive system is all about output. It develops by doing and experimenting. We see the expressive system in action when we see children "practice" many of the things we are modeling in class. You might not see them do the exact same things we are doing — it might be a movement we were doing three songs ago — but this practice is what helps us "see" the achievement in our children. To achieve basic music competence, the receptive and expressive systems must be connected — think of a continuous loop between input and output. Your children are learning by showing up to class and playing. To support their primary music development, we encourage you to sing and dance at home every day! In next month's blog post, we will discuss the important role that you play in your child's musical development. For now, know that you have a musical child who is in primary music development, and who needs exposure and experimentation with music-making both in class and at home. Keep singing and dancing, making lifelong musical memories together! 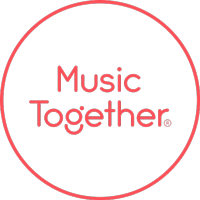 Remember to mark your calendar for our Family Concert with Uncle Gerry and Aunt Denise from the Music Together recordings! Save the date and join us for this special event on February 18 at 4 pm at Life HTX (2512 Woodhead St, Houston, TX 77019), where we will also have a silent auction benefiting the Prelude Music Foundation.